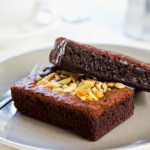 This healthy brownies recipe is loaded with chocolate and delicious macadamia nuts. It contains no grain flours or meals at all! Rich and Chewy. It's low carb and keto diet friendly. Cream butter, erythritol, and coconut oil together. Cream 2 eggs into the butter mixture. Add your cocoa, baking powder, vanilla extract, and almond flour slowly, mixing it in thoroughly. Add 1/2 Cup Macadamia nuts and mix well. Spread batter into a baking sheet and top with the rest of the Macadamia nuts, pressing them into the batter to submerge them. Bake in the oven for 25 minutes, or until a toothpick comes out clean. Let cool for at least 15 minutes.